Rory McIlroy speaks after his round. 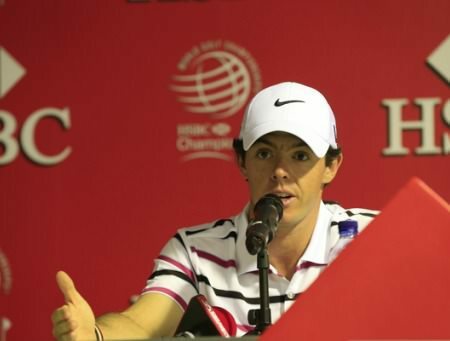 Picture: Eoin Clarke/www.golffile.ieTalking the talk is one thing but Rory McIlroy walked the walked and backed up his belief that he is closer to winning the WGC-HSBC Champions than missing the season-ending DP World Tour Championship when he opened with a seven under 65 to take two shot lead at Sheshan International in Shanghai. Building on the positives of his performances in the Korea Open and the BMW Masters over the past fortnight, the world No 6 fired eight birdies and dropped one shot to put himself in position to win for the first time since he captured the DP World Tour Championship and with it, the Race to Dubai title, almost a year ago. Keeping it going for all four rounds is now the challenge for McIlroy, who has regained confidence with a new driver-ball combination and improved his feel on the greens. Needing a decent week to rise from 62nd in the Race to Dubai standings and comfortably into the top 60 who qualify for the Tour Championship, McIlroy could add next week’s Turkish Airlines Open to his schedule. That seems unblikely now but should he capture the €1,012,145 first prize on offfer his week, he could move into the top five and within striking distance of leader Henrik Stenson, depending on results. He was certainly pleased to be leading a tournament outright after the first round for the first time since his captured his first major, the 2011 US Open at Congressional. Back to his best? There’s no doubt that he’s getting there after year of troubles on and off the course. “I came here yesterday and talked about how I like this golf course and how I felt like it set up well for me,” said McIlroy, who putted well and avoided the unforced errors on the greens that marred his last two events. “It felt good to be out there and be in control of my golf ball. I gave myself a lot of looks for birdies. “It’s a great start. It’s only one round of golf but it’s definitely the way I wanted and needed to start this week, keeping in mind that I obviously want to play myself into Dubai and try to pick up my first win of the season, as well. Rory McIlroy. Picture © Getty Images“It felt pretty good out there. I let a couple of putts get away from me, a couple of the downhill ones, but I was able to hole ones coming back, which was good. “I’ve tried to stay patient the entire season, and I know that if I believe that I’m working on the right things and I am working on the right things, then things will start to fall into place sooner or later. Going through his round, which started with a birdie at the 10th, he said: “Tried not to 3-putt yesterday and I didn’t have any 3-putts today, which was a positive, which was a good sign. So yeah, I mean, put a new lob-wedge in the bag, as well, on Tuesday, just to get a little bit more spin around the greens, and it’s seemed to work. “We started on 10, so I hit a lob-wedge there from 85 yards to a foot. 12 was a good birdie. I got a little unlucky on 11. Plugged it in the face of the bunker off the tee, and actually hit a great third shot about 160 yards and didn’t quite make the putt. “Good birdie on 12, held a nice —I hit 5-iron in from 225 or whatever it was and held a nice putt from 20 feet to get that shot straight back. 14, took advantage of my length there. hit 3-iron into the green, 2-putted from about 40 feet. Again, 16, I hit 3-wood just over the back edge of the green and was able to get that up-and-down. 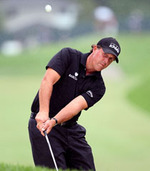 “18, hit a drive and 3-iron just short left of the green and was able to get that up-and-down. First hole, it was probably my first loose shot of the day. Hit a drive right but sort of got away with it. Had a decent lie in the rough and hit a 9-iron from 160 yards to 12 feet I guess. 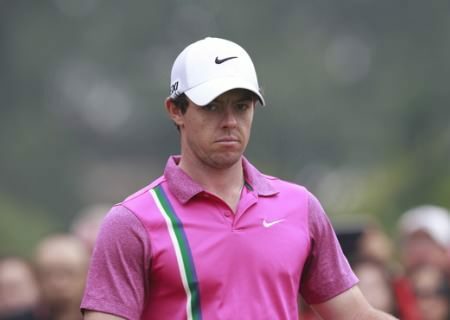 McIlroy regards his poor year as nothing more than a blip in a long career and insisted that he has not allowed himself to get over-frustrated. “I’ve tried to stay patient the entire season, and I know that if I believe that I’m working on the right things and I am working on the right things, then things will start to fall into place sooner or later,” McIlroy said. “It’s obviously frustrating when you’ve had a couple of seasons previous where you have had success, and not being able to emulate that - there’s times where you definitely get frustrated. I wouldn’t say that I was restless in terms of trying to get a win this season, because I think that the best way to approach it is to stay patient and not to force the issue too much. And that’s what I’ve sort of tried to do. “You know, the way I look at it, if I have a 25-year career, you know, nine months of a 25-year career isn’t actually that long. It’s not even a whole —if you look at in the time you play a 18-hole golf course, it’s really a half a hole that you’re struggling on. Graeme McDowell, who trails Race to Dubai leader Henrik Stenson by €443,725, posted a three under 69 to the Swede’s two over 74 to share eighth place. But it was a day to forget for Open champion Phil Mickelson, who joined McIlroy at the top of the leaderboard with his sixth birdie of the day at seventh before dropping five shots on his last two holes. The left-hander watched his third shot come up short of the flag and roll down a bank into water at the eighth, took a penalty drop and then spun his fifth shot from the drop zone back into the same hazard. After eventually two putting for a quadruple bogey nine, he hit his approach to the ninth into the water to the right of the green and bogeyed to post a one under 71. England’s Simon Dyson is an absentee this week but he was still in the news following his disqualification for tapping down something in the line of his putt in the second round of the BMW Masters last week. David Garland, director of tour operations, has decided to summon Dyson to appear before a three-man disciplinary committee in a fortnight’s time. “After an initial report that claimed he had “no recollection” of the incident, officials are understood to have collected evidence on other violations of which Dyson, a six-time winner on tour, has been accused this season. “I have been informed of the procedure being put in place by The Tour following my actions during the second round of the BMW Masters in Shanghai last week and am perfectly happy to co-operate with the investigation by the independent disciplinary panel. “I would like to say at this stage that I have never deliberately broken the rules either on this occasion or in the past. It was only after I was shown the replay of my action after marking the ball on the eighth green during the second round that I realised what I had done and that I was in breach. I immediately accepted that I should be disqualified. Scotland’s Elliot Saltman was handed a three-month ban by the committee in 2010 for repeatedly marking his ball incorrectly at a minor tour event in Moscow. “On Friday October 25, 2013, Simon Dyson was disqualified from the BMW Masters presented by SRE Group at Lake Malaren Golf Club in Shanghai, China. Under the Rules of Golf he was found to have breached Rule 16-1a, which states that a player must not touch his line of putt. He subsequently failed to add a two-shot penalty to his score when signing his card, and as a result was disqualified under Rule 6-6d. Television viewers had alerted The European Tour to the incident, which took place on the eighth green during the second round. “Under The European Tour regulations, the three person panel will comprise an independent lawyer, an ex-Member of the European Tour or current player on the European Senior Tour and an experienced sports administrator. The player in question will then be asked to appear before the Disciplinary Panel at a hearing that will be convened on at least 21 days’ notice to the player. Dyson is entered for next week’s Turkish Airlines Open where he needs a big week to qualify for the DP World Championship. He’s currently 68th in the Race to Dubai, more than €80,000 outside the top 60 who make the end of season event in Dubai. Rory McIlroy set the Race to Dubai alight with a brilliant nine under 63 earning him fourth place in the WGC-HSBC Champions. Rory McIlroy has Dubai on his mindThe Holywood starlet, 20, fired the lowest final round of his career to scorch up the leaderboard and finish just two shots behind winner Phil Mickelson at Sheshan International. The Ulster ace banked €211,988 to move from third to second in the Race to Dubai standings and is now just €52,320 behind pace-setter Lee Westwood with this week’s Hong Kong Open and the season-ending Dubai World Championship to go. McIlroy: "There's a good bit of work that needs to be done to my game"
Rory McIlroy prepares to tee off in the final round of the WGC-HSBC Champions. 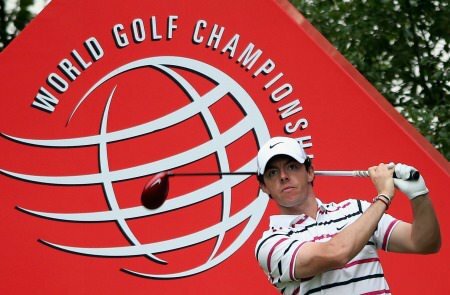 Picture: Eoin Clarke/www.golffile.ieRory McIlroy claimed his place in the season-ending DP World Tour Championship with a sixth place finish in the WGC-HSBC Champions.